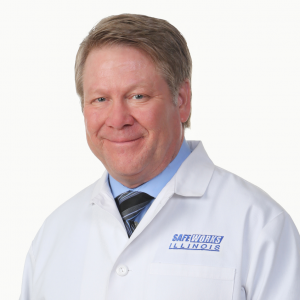 Dr. David Fletcher is the founder of SafeWorks Illinois. He is expanding the practice to include immediate care/urgent care services. Offering another CHOICE to the Champaign-Urbana community is the driving force for opening 217 Immediate Care. We are excited to provide this service to the community and to our existing clients, their employee and family members. We know how valuable employees are to the health and well-being of our clients, which is why we wanted to expand our existing service line to include immediate care for minor non-work-related illnesses and injuries. Dr. Fletcher, M.D. is highly-respected in the State of Illinois and nationally for his wealth of knowledge in the specialty of occupational and preventive medicine. He was appointed by Illinois Governor Rauner to the Illinois Workers’ Compensation Commission (IWCC) medical fee advisory board in January 2016. Dr. Fletcher is at his best when sharing what he knows. He is an excellent clinician and enthusiast coach and mentor. Dr. Fletcher is a board-certified physician in Preventative and Occupational Medicine. He is also certified as a Federal Aviation Administration Senior Medical Examiner. He is a certified NCRME provider and testifies as a DOT medical expert witness focusing on truck driver health issues and the quality of their medical certifications. After serving 10 years in the US Army medical corps, Dr. Fletcher has practiced occupational medicine and has provided urgent care services in Central Illinois for more than 3 decades. He has admitting privileges at Presence Covenant Medical Center in Urbana. Dr. Fletcher earned a bachelor’s degree at the University of Illinois at Urbana Champaign in December 1975. He earned his medical degree in November 1979 at the Rush, School of Medicine in Chicago, Illinois and a MPH at UC Berkeley Medical School in California. He served his residency at Walter Reed Army Medical Center, Washington DC and Ft. Ord, Monterey, California. Dr. Fletcher is a certified Medical Review Officer (MRO) and Substance Abuse Professional (SAP) with vast experience in setting up drug testing programs and reviewing drug test results. He has provided occupational health services and consulting to companies of all sizes for over 35 years and has made numerous presentations on a variety of occupational topics at the regional, state and national levels.